As the manager of JWI’s online magazine, I’ve been soliciting two types of articles this fall: pieces exploring aspects of women’s leadership ahead of our annual Women to Watch event on December 3rd, and about why women are voting and running for office to appear alongside our fall Hear Us Vote campaign leading up to the midterm elections on November 6th. The experience of reading and discussing these pieces has been interesting, but also nourishing: in this negative political climate, I’m so happy to be able to highlight women leaders and have a reason to be hopeful about the political future of our country. This process has made me realize something that I hadn’t fully appreciated before – that I have my own female role model whose leadership and civic engagement is noteworthy – Betsy Elzufon, AKA my mom. And of course, politics were and continue to be a topic of conversation at the dinner table with my whole family. Around the 2016 election, I saw my parents both get even more politically involved – my dad knocked on doors on Election Day and my mom staffed a phone bank. After the election her civic engagement intensified as she helped to organize branches of two progressive advocacy groups, People Power and Indivisible, in her county. I’ve been especially impressed to hear how this involvement has changed her perspective on our local community. “One thing that surprised me is that not everyone in [Davis, California] has had the opportunities I’ve had. I think of us as a welcoming community, but I’ve found that Davis is not as welcoming and friendly to the LGBTQ community, nor to people of color. And it’s shocking to me that if it’s like that here, what must it be like to be in other places? 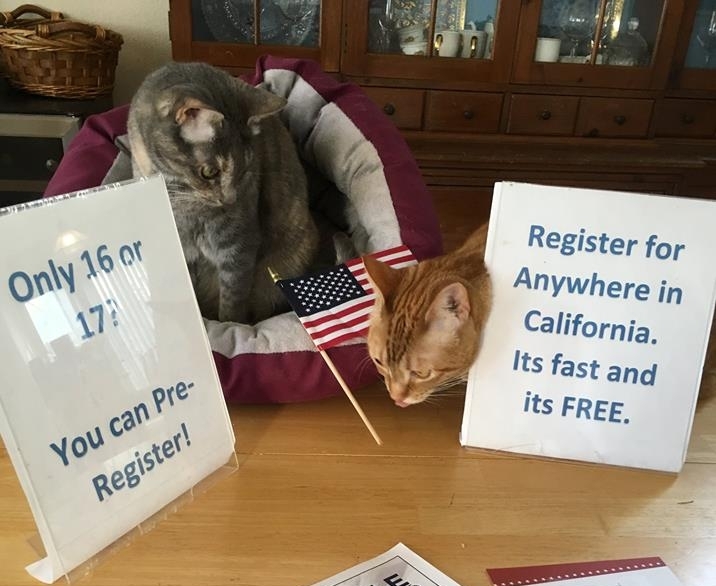 Now, Mom’s main focus is voter registration. She’s been attending events and going out in the community to register voters – at food truck festivals and farmer’s markets, as well as at high schools and college campuses. Since February, she told me, she has helped to register 150 voters. Again, she’s a facilitator, collecting names, creating a process, finding events. “People want a way to be active and get involved, I’m just showing them how to do it,” she tells me. Almost every time we talk, she has a new event that she’s going to. Always thinking about how she can be more effective, she is learning how to ask – in Spanish – if someone is registered to vote. This is only the tip of the iceberg of her newfound political engagement. She was involved in the local City Council elections this year and hosted a meet and greet with one of the candidates; she also met with the Chief of Police and helped to initiate development of a more rigorous citizen police oversight process, and more. I’ve always thought of my mom as a leader, but her energy and commitment to causes, this year and last, has inspired me enormously. Whatever your political leanings, make sure you’re following her example, and you’re ready to vote on November 6th! Valerie has been in DC for 2.5 years, and questions the decision every time the humidity acts up. She is an unapologetic avocado toast consumer, subscribes to too many podcasts, collects sweatshirts, befriends cats, and manages Marketing and Communications for JWI in her spare time.